I’ve taken a couple weeks’ break because I was on vacation; my son and I roadtripped out to California at the beginning of the month and internet access was spotty. So since it’s a new month (although towards the end of it), let’s switch stories. 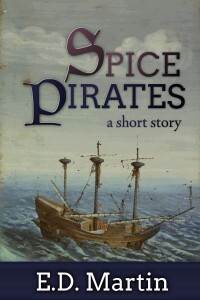 For July and August, I’m going to be pulling from “Spice Pirates,” my long short story that’ll be released on Amazon this week. Rosamaria’s sick brother Basil just wants to be a pirate, so she enlists the help of her friends Origano, Clovio, and Anisa to take him on a pirate adventure. But then the REAL pirates show up…. Origano’s ship arrived in the harbor at midmorning. There was nothing auspicious about it, nothing to portend that fortune and disaster would fall on the town or that the lives of its most prominent families would soon be irreparably altered. He hopped off the gangway onto the dock with a satchel over his shoulder, a straw hat jauntily on his head, and a spring in his step. He’d made it safely across the ocean and was now free in the New World, with no overbearing family to tell him what to do or what to be. Free to find his destiny. I remember the snippets from this story before, which were fun and intriguing. I love this guy’s attitude – lunch before destiny! LOL. I love how the names of your characters fit with the title of the tale. Lunch, then destiny. Sounds like a good idea. You get a much better destiny on a full stomach. Priorities! Second lunches too, like the Hobbits! Cute snippet. That last line made me laugh. Great snippet and congrats on the upcoming release! As a reader I tend to skim setup details like paragraphs one and two to get to the action of the story like in paragraph three. Perhaps you can show the ship (details in paragraph two) later? I loved the ending to this snippet.